An exquisite purse-sized boutique paperback journal, duplex cover, offers 365 verses to consider in your life. Write your own story! See God's amazing agenda unfold. During this spiritual journey, a reader creates a real-time journal of intimacy with God. Leave a 365-day legacy. One question and one verse per day from Genesis to Revelation.Want the emerging picture of higher purpose in your life? Use this fit-in-your-hand personal square diary for understanding your life events. My Step Journal is a way to evaluate your activities into a place of universal purpose in God's design. Find happiness with this life-application journal. It was envisioned and written by a woman who has overcome the limitations of severe learning disabilities. This fit-in-your-hand personal square journal offers an opportunity to write your own notes and story of life. Chronicle the mysteries of God's word to you as the Holy Spirit leads, protects, and gives insight into your life events and your world.Diane Andrews has written a dynamic, interactive book for use in a private experience or to leave as a legacy to your loved ones. My Step Journal is a life application journey, a way for busy people and those who don't know their way around scripture to read one verse per day, 365 Bible verses a year, and to meditate on them. You can now evaluate your life by deeper meditation on verses from Genesis to Revelation, by seeing God's loving and amazing agenda. Chronicle the mysteries of God's word as the Holy Spirit leads you, protects, guides, and lends insight into the activities of your life. 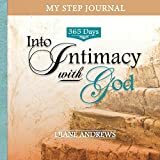 With a verse-per-day for an individual's spiritual journey, a reader meditates on 365 verses in a given year and creates a real-time journal of intimacy with God. Diane is best known for instigating, organizing, chairing and directing R & R Retreats and purse auction fundraisers in Colorado. She is also a respected Biblical conference speaker, known in Thailand, Mexico, and Southern Africa.